Lots to talk about here. 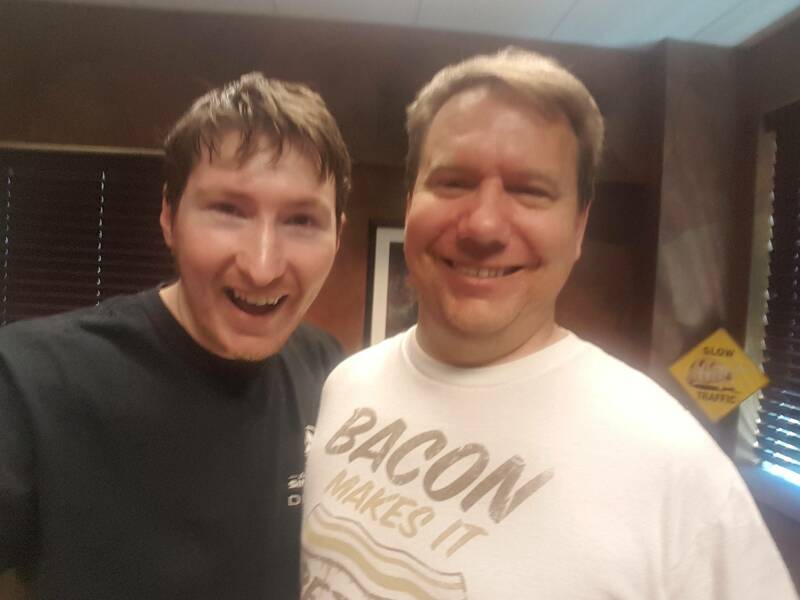 Last month I was at Stardock headquarters in Michigan, USA all the way from Australia. I had an incredible time, and while I was there we crafted up a roadmap for the rest of 2017. Here's a dorky photo of Brad (Draginol) & I. Check out the video below to hear all about the update! If you crave more detail, keep reading. There won't be an update in July, partially due to Stardock being closed last week for the 4th of July celebrations, and partially due to having so much we want to get packed into the 2.4 update coming August. Here's what you can expect for 2.4, and I'll expand upon some of them. It's possible that not all of them will be ready for in time for 2.4. So if the last ones aren't ready in time they will be shipped later. 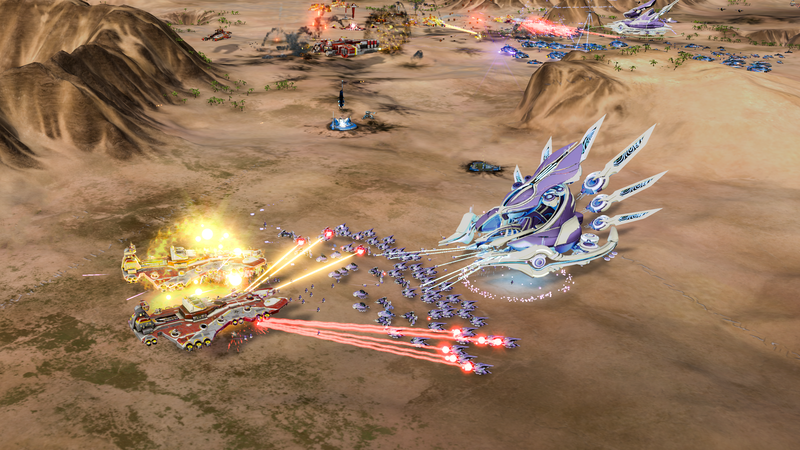 The ability to modify game Physics, unit Movement and Unit Formations. The cheat menu in the modding Steam beta now allows swapping between every player instead of just toggling between player 1 and 2. Configuration files in mod directories now add to the base configuration instead of replace. This means modders won't have to go back and update their mod as we continue to update the base game. There's some minor tweaks to all 3 campaigns and the scenarios, mainly bug fixes or to make them better balanced and updated for the various changes to the game since they came out, such as gunships being much stronger and Smarties no longer targeting air. There's a lot of new content and improvements that we'll be working the remainder of 2017. Here's what you can expect to see over the next few months. Modding will continue to be a priority for us and we are working on improving the capabilities and functionality for modding every major update. We also will be creating more and better documentation to explain the modding process to anyone who is interested, as well as make changes to make the process more intuitive. We are keen to equip both factions with air transports in order to add more depth to the game by creating additional strategies and room for harassment. Air Transports (and equipping the AI with the ability to use them) will open up a lot of options for more unconventional map design, which some of our modders have already been experimenting with. The plan is to have two Air Transports for each faction, a light and heavy transport with different carrying capacity. We want to improve the visual polish and presentation. This will involve destroyed units leaving wrecks, and the edges of maps having a nice Skybox. We also have some updates to our engine which will overall improve fidelity. A commonly requested feature. We will have the ability to rebind any hotkey in the game. This release would also coincide with some additional Quality of Life buttons such as "Select all units." or "Select Factory"
We have more Dreadnoughts and more Juggernauts on the way! We don't have dates for these yet but stay tuned. We think our sophisticated multi-core AI is the best on the market and one of the strengths of the game. We want to tap into this by releasing some co-op Scenarios. Team up with your friends against a super powerful AI or combine defences to hold off against wave after wave of enemy attackers. Sounds fun right? Some of our existing Scenarios would convert well to co-op, such as "Against All Odds", so down the line we'll be converting some of the single player scenarios and creating additional ones for co-op play. So that's it for now! I'm proud of what we have done so far in 2017 and looking forward to seeing where Ashes will be by the end of the year. Good to hear, but please focus more on the engine, the game still crashes a lot, rendering the game unplayable sometimes. Even on a full AMD rig. Juggernauts? Way to go! We need more! As mentioned, DX12 stability (Make it crash less) will be part of 2.4 and we will continue to work on it. Any hope of fixing the glitch where you suddenly can't select units? Is Vulkan still in the running? I had thought it was going to be coming out this update, but it's not on the list. But now it's also not on the list of planned stuff. Really hoping it hasn't been dropped, as I've no intention of moving to Windows 10, but would like to use both my cards. Any way to improve the connecting ley lines between nodes? ATM, the only real way to see the routes is to look at the mini map, or pull up the main map. Impassible terrain is not so clearly identified and the ley lines are a dull muted color. At the least, I would like a clickable option in game menu to increase the visibility, or have them flashing if I loose connection to main base. Yes! I'm glad someone else is asking for this too. Don't tell anyone else, but I like to turtle... and wish I could discern impassable terrain from high up. Awesome guys thanks for the update! really looking forward to QoL improvements and Vulkan.